Tournament Indicator is an advanced online poker tournament odds calculator that displays instant poker tournament odds in real time while playing Texas Hold’em Tournaments. 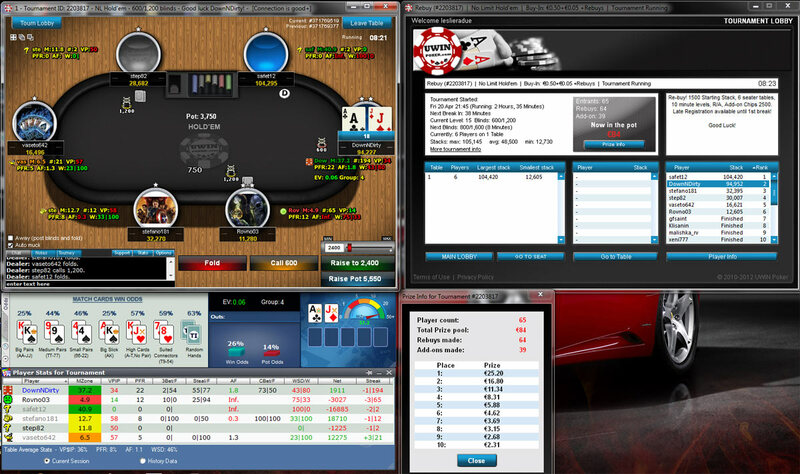 The poker tournament tool is simple and easy to use, it calculates accurate poker odds, pot odds, number of outs and table position via it’s HUD. While it largely resembles Holdem Indicator as it is made by the same poker tool company, Tournament Indicator has several added features optimized specifically for holdem tournament play and includes an MZone odds calculator. The Mzone is the ratio of your chip stack to the blinds and antes. This number is crucial for success in tournament play. The Tournament odds calculator – Tournament Indicator has another feature in “Match Cards” which is used to assess situations late in a tournament where you might go allin, it makes comparisons of heads up all-ins that your opponents may be holding and shows you your percentage chance of winning your hand. Sklansky Group ratings and EV for preflop starting hands are visible preflop as are opponent statistics and any betting patterns they may have exposed. Tournament Indicator calculates odds in real time and displays all the information in it’s HUD the poker tournament odds calculator simply makes you play better poker by being more knowledgeable about your opponents and playing your cards to the best odds. Tournament Indicator is one of the most popular tournament calculators that is specifically designed for Texas Hold’em tournament players. It’s easy of use and simplicity make it an excellent HUD with it’s accurate odds calculations and MZone indicators you are rest assured far more clued up about your standing in the tournament than any of your adversaries. The player tracking feature in Tournament Indicator allows you to find and exploit any weakness in your opponents, the Tournament odds calculator automatically profiles players and shows which players may be on tilt with Tilt Factor Monitoring that displays your opponents potential to tilt . It tracks hand streaks in wins and losses and a totals on the player’s stack over the last 10 hands givings you insight into that players current mode of play. The poker EV calculations displayed in the HUD preflop are a great help for pre-flop starting hands, the poker EV odds data was compiled from live online poker table data and shows the true odds value of your hand. The Pot Odds percentage helps you make decisions based on the pot size vs hand strength as does win percentage. Mzone automatic calculations of you and all players at the table. Poker calculations made: Win Odds, Pot Odds, Hand Odds, EV, Group,OUTS and position. Allin odds display odds of your hand vs other hands. Tournament Indicator’s HUD is simple to use while displaying all the information needed to help you make the best decision while playing Texas Hold’em tournaments based on the accurate calculations the tournament odds calculator makes in real time. The Mzone tells you exactly when you can afford to play for that long shot and when to shove based on your stack size relative to the tournament as it progresses. Green Zone – MZone higher than 20, many strategy options available. you can raise, re-raise and have chips left if you lose a hand. Yellow Zone – MZone between 10 and 20. 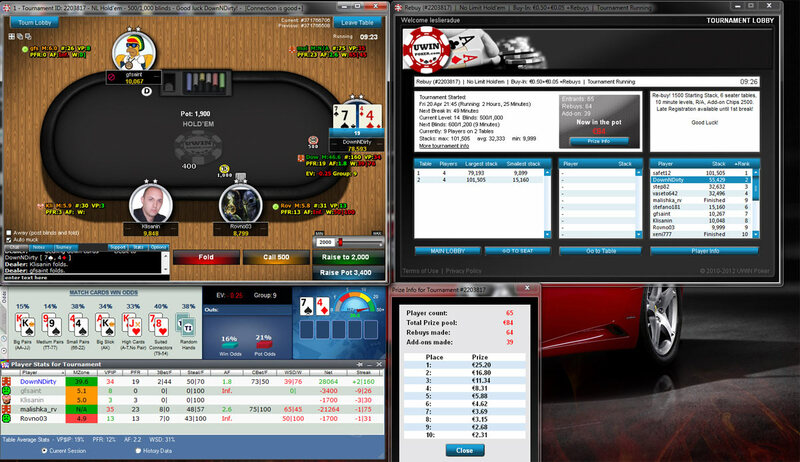 Loosen up play, stop the blinds eating away at your stack. Small pairs and suited connectors are less desirable now as your implied odds (chance of winning a big pot from a small investment) are lower. Orange Zone – MZone between 6 and 10. You have lost the ability to “resteal” and your stack is getting smaller, aggressive play is needed to stay alive in the tournament. Red Zone – M is 5 or less. Here you have lost all flexibility if you play a hand it should be all-in, try being the first into a pot to maximize the chance opponents will fold. Dead Zone – M of less than 1. Here you are on the tournament critical list – any high cards are good enough to move all-in with. 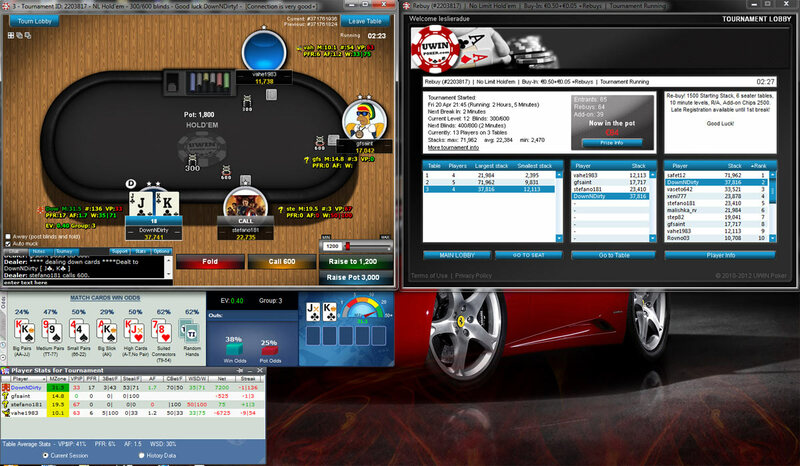 The poker tournament tracking software that Tournament Indicator provides is more than adequate for most players, its provides easy to read accurate stats about your opponents and their play based on the past tournament history. The following are all tracked by Tournament Indicator software. Screenshots of Tournament Indicator, see what it looks like in action, click on the images to enlarge. 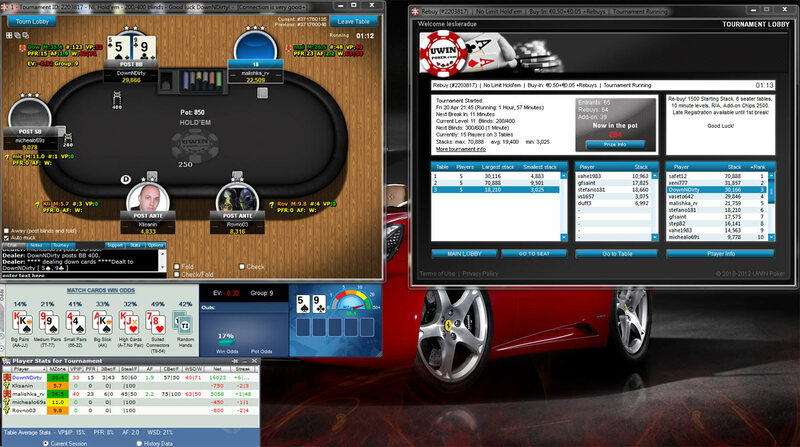 My first test run of the suite saw immediate results, I came in third place despite being chip leader with 3 remaining. Still not too shabby considering I only made the original buy i, no rebuys and one addon. My second tournament I joined into final registration and also tripled my buyin, guess I should start playing more tourneys with this tool. Tournament Indicator software supports over 300 poker rooms and covers Limit, No Limit and Pot Limit Texas Hold’em tournaments. Below is a list of some of the poker networks and rooms supported. Tournament Indicator software usage is approved by all popular poker rooms and is on the allowed poker tools list for PokerStars. Merge Gaming Network : Carbon Poker- ACED Poker Cake Poker Network: Cake Poker Everleaf Gaming Network: UWinPoker used in screenshots for poker tool review. Tournament Indicator licenses can be purchased directly for the price of 79 Euros directly from the poker tool developer, payment options include Paypal, Moneybookers or credit card. The license includes a life-time license for Tournament Indicator with unlimited usage, never pay again even for new updated versions and 24/7 Customer Support. Tournament Indicator certainly is one of the better Holdem Tournament Odds Calculators due to its uncomplicated easy to use features, allowing you more time to concentrate on your game while performing calculations on your odds seamlessly. We highly recommend this poker tournament tool and for the price including a lifetime of updates makes this tournament odds calculator good value for money.